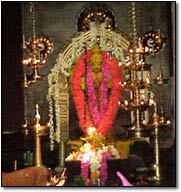 Chakkulathamma, the famous miracle worker, is housed in this temple. People from all religions are permitted to enter this temple. Lady worshippers offer "Pongala" to the Goddess on the Thrikkarthika Day of the Vrichika month. Chakkuluthucavu Temple is located near the Neerettupuram Junction on Thiruvalla - Edathuva route.